cooking | Boy Eats World! 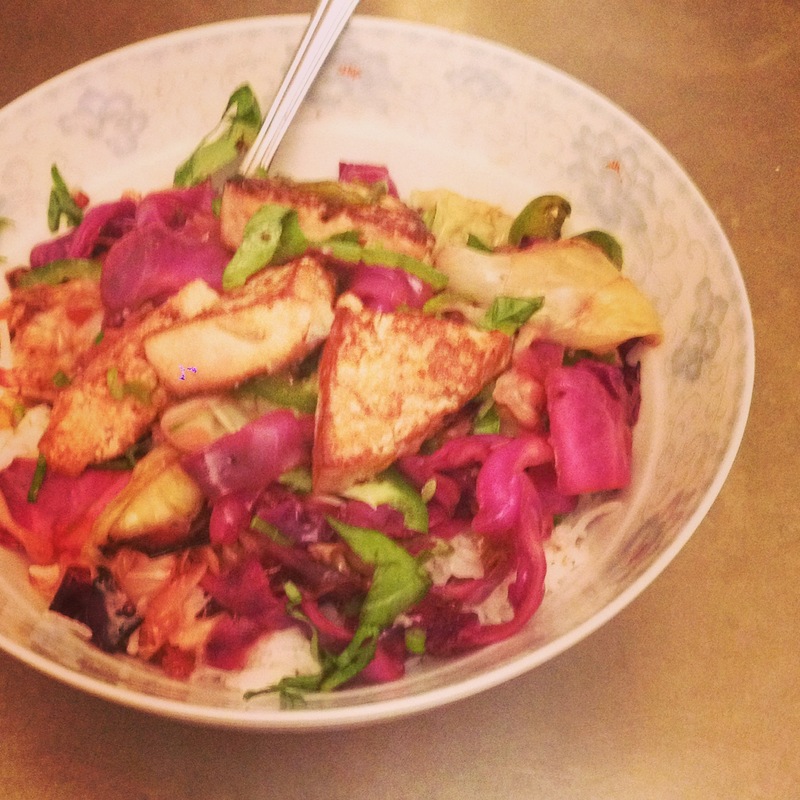 This weeknight wonder is great for anyone who is low on time, yet is health conscious. The salmon only needs about 20-30 minutes to marinate and get deep flavor. During that time, prep your veggies and/or starch and you can have a full meal ready in under an hour (including washing up!). You can easily do one fillet, or up to six. Adjust your acids if you desire, use Ponzu instead of Soy Sauce. Put in some cilantro to add freshness or mustard to up the spice. Do your thing and make it yours. Just remember to make more or less marinade depending on how much fish you’re cooking. Place salmon in a prep bowl or dish. Add tamari, vinegar, sugar, garlic, ginger and pepper to salmon fillets, toss to cover. After 10-15 minutes, flip fish in marinade. Once fish is fully marinated (10-15 more minutes) move fillets to a parchment lined jellyroll pan. Roast for 10-12 minutes for medium rare. Serve immediately or keep warm up to 30 min in a cooling/slighly open oven. 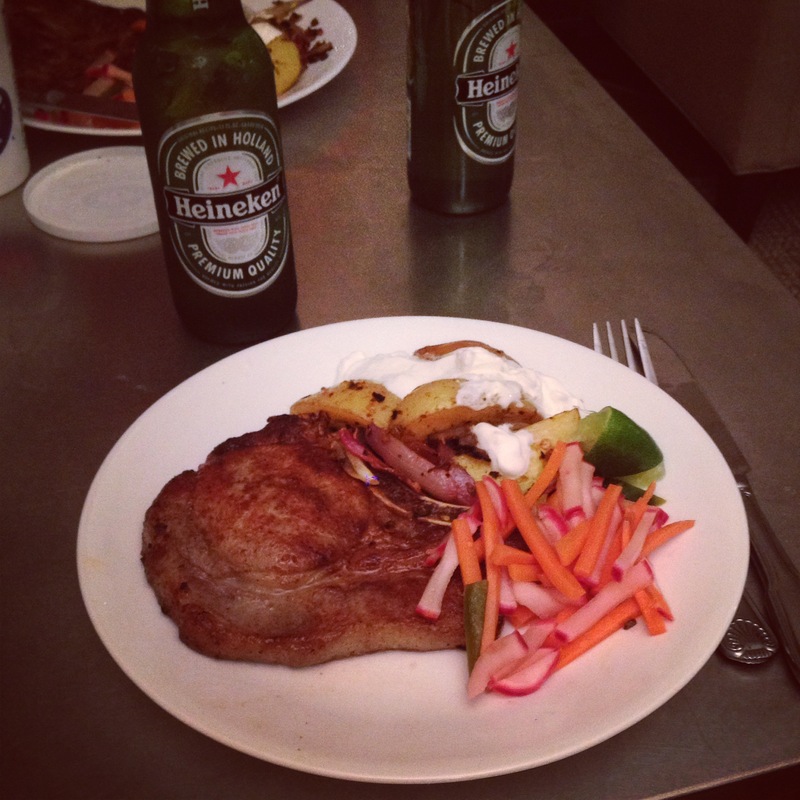 I served these earthy chops with quick pickled veggies for freshness and crunch and spicy roasted potatoes. Turn heat up to med-high on heavy bottomed pan. Add chops to pan, listen for a gratifying sizzle. Resist the urge to move the chop for a minute or two. Turn heat down to medium after about 30 seconds in pan. Cook for 2 more minutes. Flip chops, turn up heat for about 30 seconds, then down again. Sear the sides of the chops using tongs. Repeat process with remaining two chops. Allow chops to rest about 10 minutes prior to serving. Enjoy with a fresh salad or quick pickled veggies and a starch of your choice! I made these salmon cakes after watching Damaris Phillips’ Food Network show, Southern at Heart. I thought the idea was genius. Filling, flavorful and fast. I adjusted the recipe to be more practical for a simple weeknight meal. Serve it with cooked quinoa and a simple acidic spinach salad. Acid really cuts the richness. 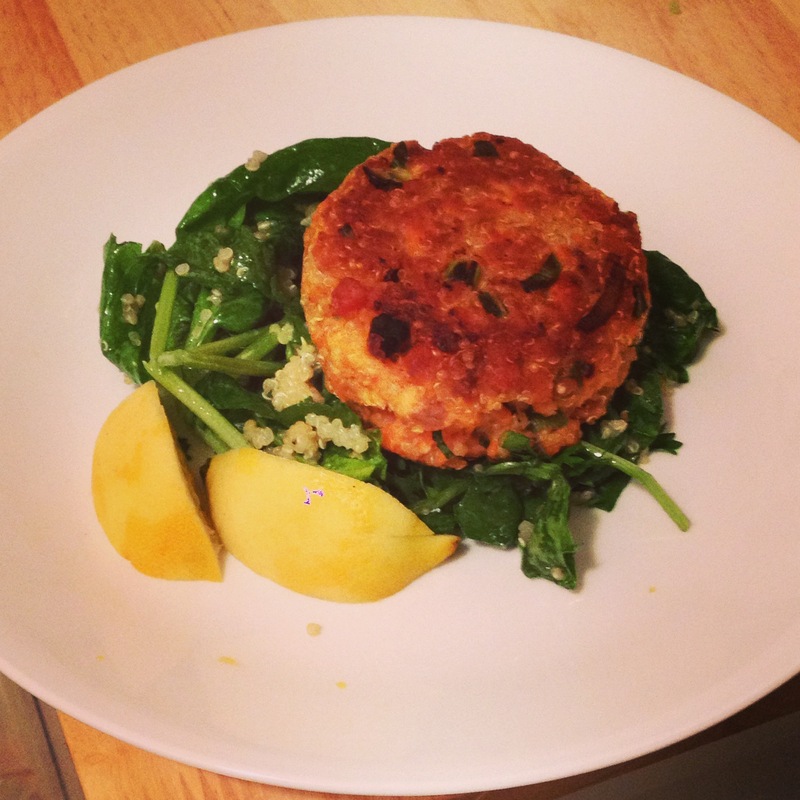 These salmon quinoa cakes taste indulgent, yet they are packed with good fats and nutrients! It’s a win-win. Serve with lemon wedges, an acidic salad and cooked grains. So I’m not a huge vegetarian cook, but I do live in New York and I’m in my twenties, so I’m always looking for ways to make inexpensive meals with milage. I also love Chinese flavors, so viola! Thus came about my marinated tofu with spicy coconut cabbage. This recipe is ripe for adaptation. No soy sauce? Add some salt. Can’t find cabbage? Try bok choy or broccoli. Like it spicy, add some chili oil with the coconut oil. Be adventurous! In a large bowl or flat bowl, combine and mix all marinade ingredients. Drain and rinse tofu. Make ½ inch slices, then cross slice into triangular slices. Pat tofu with paper towels to remove excessive moisture. Add tofu to marinade and make sure all pieces are well coated. Cover with cling wrap. Refrigerate, at least overnight, up to three days. Carefully remove tofu from the marinade, reserving the liquid. Dab with paper towels to help with browing. Preheat wok or skillet to high. Add canola oil when pan is heated. Add reserved marinade, cook a minute more until thickened, then..